Injectable preparations with biomimetic peptides and purified with hyaluronic acid. Larger contents – 2 ml. If in one procedure use 2 or more injection syringes, the price of one syringe beeing 180 eur. 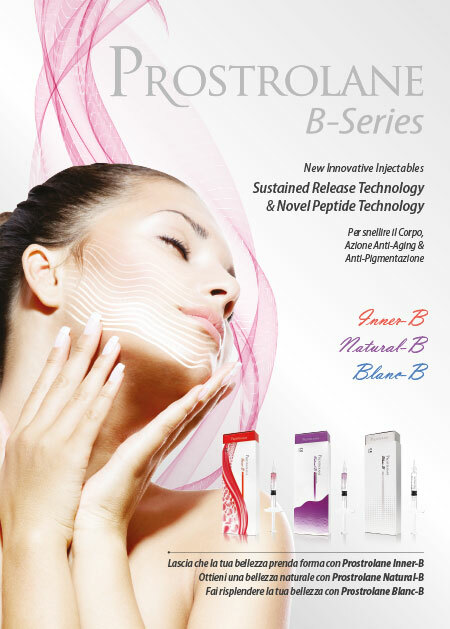 Prostrolane Blanc (2 ml) Promo! 1 procedure every 2 weeks. A total of 2 courses. If two microinjection syringes are used in one procedure, the cost of one syringe is 200 euros. 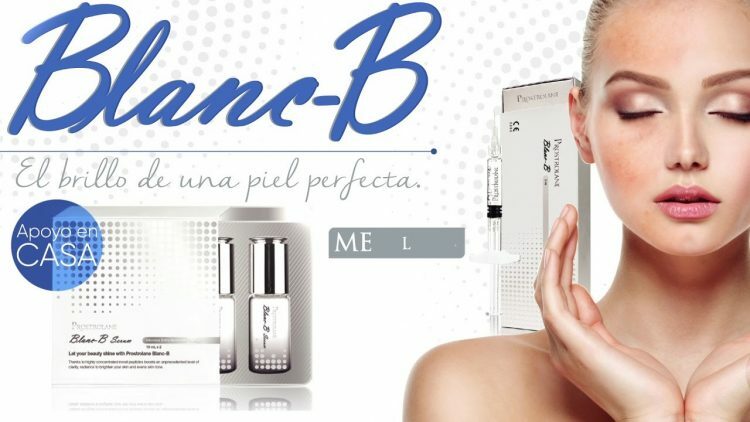 Blanc B – for skin contouring, brightening and reducing skin pigmentation, acts against photo-aging! Natural skin glow with Prostrolane New generation of peptides and purified hyaluronic acid with prolonged-release technology! cross-connections enhance the result of rejuvenation and provide a longer conservation of effect. Octapeptide-11: activates cell regeneration, improves skin appearance and tone; Oligopeptide – 92: suppresses endogenous hyaluronidase, reduces small and moderate wrinkles, brightens the skin and increases its glow; Feruloyl oligopeptide-33, Valprooyl oligopeptid-33: anti-pigmentation effect, reduces the effect of photo-ageing and wrinkles. 1 procedure every 2 weeks. A total course of 2 procedures. It is a skin-refreshing and anti-pigmentation product made up of a complex of bioactive ingredients, such as biomimetic peptides and hyaluronic acid, which maintain the hydrolysidic upper layer of the skin and maintain a constant pH. 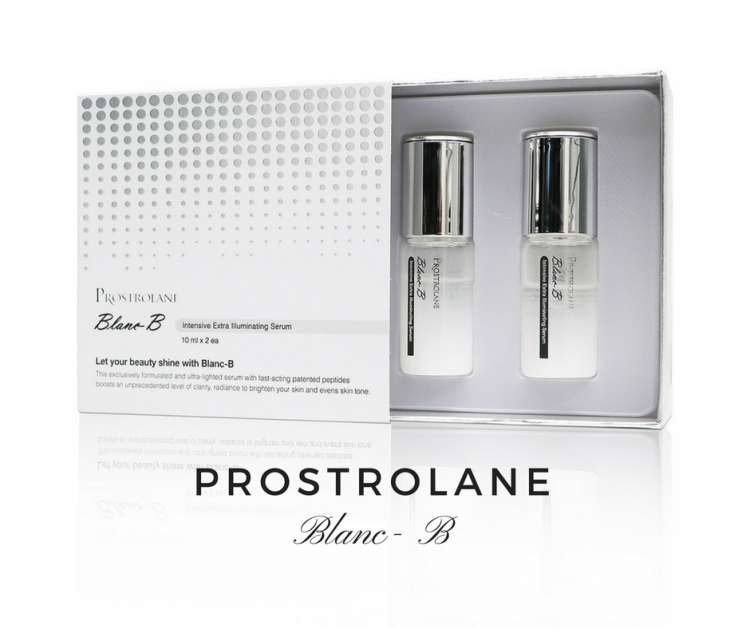 Prostroaline Blanc reduces wrinkles, shrinks pores and stimulates skin cell renewal. A light face and neck skin serum. The serum has been created as an extremely fast-acting patented peptide complex. Serum brightens the skin of the face and makes it shine. Restores the damage caused by photo ageing. Lightens pigmented spots. absence of enhancers – the preparations do not contain enhancers that can alter the DNA structure. The new generation of peptides penetrates into the skin without damaging it and without changing the original structure. I do not have skin-related problems because I take care of my skin and protect it. If you do not neglect it, then you will not have problems. Sometimes, after long working days or sleepless nights, I feel that I want to pamper myself, so I go to the clinic to have Intraceuticals and HydraFacial procedures. The latter process cleans and moisturises the skin and during the first procedure various serums are used which saturate and moisturise the skin. These procedures are loved by Hollywood stars. The skin becomes smooth and clear and the results are visible immediately! I am not a frequent visitor of beauty and aesthetics clinics but I think carefully about where to go if the need arises. Their qualified professionals and very pleasant atmosphere is why I always go to Era Esthetic clinic when any problems arise in relation to my body or skin. I am very satisfied and would like to share my feelings about it with you. I found the clinic randomly while in search of a hair removal procedure using the most advanced laser technology. I discovered that Era Esthetic clinic is the only clinic in the Baltic states which uses the Alexandrito laser. This laser ensures very quick and effective results. I am very satisfied with the procedures and really recommend them to everybody. 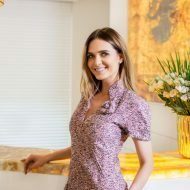 Over time and due to daily stress our skin loses its moisture, brightness and firmness, so I had a consultation with doctor Jurgita Stoškienė, who is qualified to the highest level, and who examined the skin very pleasantly and offered especially effective procedures. The results were obvious after the first procedure. The procedure I often have is HydraFacial, performed by Viktorija and Alina, who are masters of the process. I trust in them and give myself completely into their hands. I understand that regardless of what you are searching for,it is always best to come here, as only here can you find everything in one place – the best specialists, and the latest innovative technologies and hardware. All this is proven over time by the results and excellent service you will experience after going through the doors of the amazing clinic Era Esthetic. Our faces are our voiceless business cards. Moreover, every woman seeks a healthy and flawless look of her skin. I’m no exception. In addition, my work requires me to take special care of my face – quite frequent use of decorative cosmetic products requires proper care of the skin. So, in order to achieve the results I wanted, I chose the HydraFacial treatment at ERA ESTHETIC clinic. I think you will be curious to learn more about the process as well as the effects that this treatment has. Basically, it is a patented non-invasive skin rejuvenation, deep cleansing and moisturising skin care done by modern aesthetic cosmetology technology – otherwise known as an ‘all-inclusive’ treatment. Today, Hydrafacial is included in the list of the most popular cosmetic treatments performed at prestigious medical clinics and spas all around the world. This procedure has three parts. Firstly, the skin is effectively cleansed; it gets exposed to a vacuum; it’s actively moisturised by different active serums. And all this is done simultaneously, which saves us time. Isn’t that great? The treatment was done by a great cosmetologist and beauty therapist, Alina Mockevičienė, and it lasted for about 45 minutes. You know, the face is quite a sensitive, I would even say intimate, part of our body, so it’s important to choose a specialist you trust; that way you can rest assured that you are in the hands of a professional. I would highly recommend Alina because in her chair I felt super safe and comfortable. I’ll tell you what kind of results I experienced after the first treatment: it restored the elasticity of my skin, as it had been looking rather tired lately. My skin was deep-cleansed. This means the reduced enlarged pores – and, believe me, with my job specifics I’m really not lacking them…The texture and tone of my skin have improved! Before the treatment, I had noticed that my face was somewhat greyish. Another good thing that will become even more important as time goes on is that this treatment slows down the ageing of the skin! And, although I am only 23 years old and the ageing process has not started yet (it usually starts at 25 years), preventive measures are always welcome and the sooner we start taking care of the skin, the more beneficial it will be for us. To tell the truth, if seeking maximum results this kind of treatment should be done once a month or as needed. I can confirm that the treatment did not cause any discomfort; in fact, it stimulated the skin in rather a pleasant way and was relaxing. As Alina would say, it is like being given a small kiss on your face by a kitten – somewhat scratchy, but at the same time very pleasant. I hope that the kitten will kiss you as well, leaving you glowing and even more beautiful!!! I discovered laser dermatology clinic Era Esthetic several years ago and since then I have been a regular customer. The service offered by the clinic – laser hair removal – became my salvation. The quality of services offered by this clinic is really great and the results are obvious. The fact that I visit this clinic less and less often proves that the services which I need have been provided professionally and responsibly, to a high standard. I am very grateful to doctors Rita Buivydaitė and Ieva Laniauskaitė. They are professional in their fields, give a lot of valuable advice and perform their work sincerely. So I wish the clinic successful development and I am sure that it will keep on delighting its customers with excellent results.